It'd be funny if SpaceEngineer released .97, but everyone was so busy asking about the release on this thread that they didn't notice. I wouldn't be surprised if something like that did happen. You all can joke about it but it is all TOO possible that SpaceEngineer is making all wait precisely BECAUSE of so many pressuring him. And I agree 100 perzent that reverse psychology (pretending NOT to await next release) will likewise avail one naught. GOOD THINGS COME TO THOSE WHO ARE PATIENT. And as any software programmer can tell you, rushed releases are buggy releases (as a rule). Ya I think it's more likely that hes flattered that there are so many people waiting on his every word. I just know that I'll check this forum and look at the "last topic in forum" section and there will be a bunch of threads on .97 screenshots and bugs and stuff and that's when ill know. Until then, this thread isn't really much of an indicator. 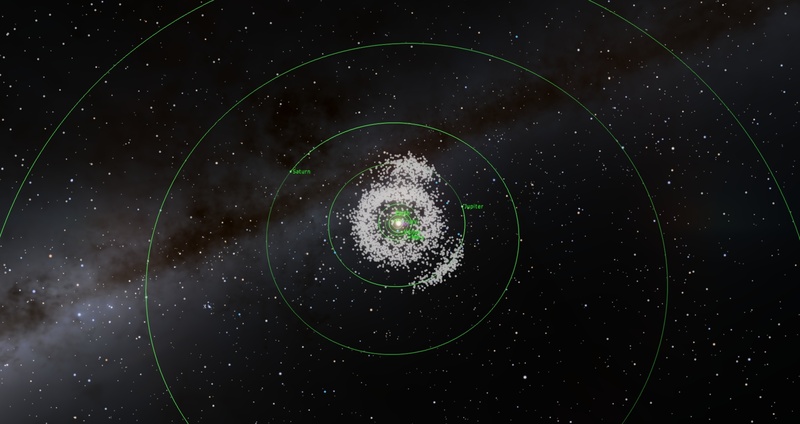 Inner Solar System with Main belt, Jupiter trojans, and NEOs (Near-Earth Objects). 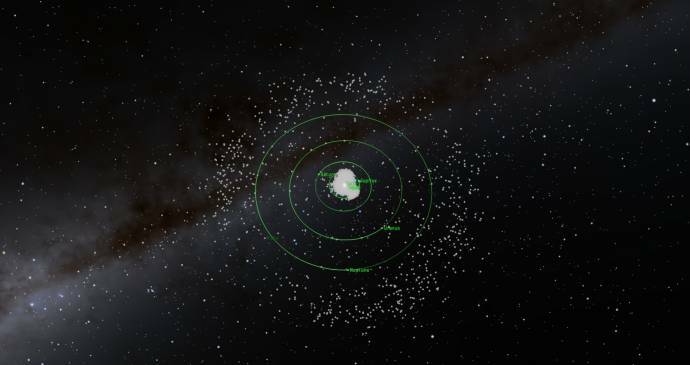 Outer Solar System with Kiuper belt, Centaturs, Plutinos, Resonant TNOs and Scattered disk objects. Note the gaps caused by Milky Way. 3.34 0.12 2456401 327.85412 72.16707 80.33008 10.59423 0.0761669 0.21402110 2.7679930 "Ceres"
4.13 0.11 2456401 310.04462 309.95442 173.11974 34.83680 0.2314997 0.21355547 2.7720151 "Pallas"
5.33 0.32 2456401 257.63928 248.30984 169.88278 12.97937 0.2553054 0.22581776 2.6707341 "Juno"
3.20 0.32 2456401 218.17155 150.94008 103.85019 7.13991 0.0882571 0.27143216 2.3624458 "Vesta"
6.85 0.15 2456401 117.11980 358.85091 141.59723 5.36723 0.1907416 0.23856139 2.5747552 "Astraea"
5.71 0.24 2456401 232.72225 239.37712 138.71044 14.74654 0.2017542 0.26086353 2.4258306 "Hebe"
5.51 0.15 2456401 271.79314 145.38098 259.63714 5.52450 0.2304693 0.26737519 2.3862832 "Iris"
6.49 0.28 2456401 250.94554 285.32996 110.92216 5.88785 0.1562033 0.30169179 2.2017114 "Flora"
6.28 0.17 2456401 49.27220 5.82053 68.94445 5.57523 0.1226962 0.26743715 2.3859146 "Metis"
5.43 0.15 2456401 121.95663 312.75812 283.41815 3.84190 0.1161087 0.17738834 3.1370348 "Hygiea"
This format is more compact and easy to load, but don't allow using parameters that a missing in the header. Objects that uses additional parameters must be excluded from the table catalog and added to the usual script catalog. Have you considered to use sqlite for organising catalogue data? It's public domain. Very nice. Would it be possible to get a list of the asteroids inside a system? Like f2 gives you a list of planets and moons. Their models don't have to be included in the list, just their names and some crucial data. Now you can just see how many there are, but for more details you really need to randomly click some of them. The option to enable their orbits in the universe map would also be nice. Very nice. Would it be possible to get a list of the asteroids inside a system? Like f2 gives you a list of planets and moons. Their models don't have to be included in the list, just their names and some crucial data. Now you can just see how many there are, but for more details you really need to randomly click some of them. You ask too many features. Every time I post some new developement progress, I recieve many suggestions. I can't implement all of them right now. So just be patient. Press F4 in the map mode. Oh sorry if I was being obtrusive. Maybe I should've made clear they were suggestions. I wasn't even implying for next release or any release, I'm just trying to express my thoughts every time you add something to this thread. Things you may not have thought of. It may seem like we underestimate your progress, but that's not the case by far. I'm honestly surprised you already managed to put such a large number of asteroids in already. I do wonder can't you speed up loading of these object groups by loading/allocating them into cloud/ring/area/zone based clusters ? I mean this as no offense of course and I can only speak for myself, but to be honest I'd rather have .97 sooner as it is now, than later with more features like this new asteroid implementation. There are already so many great features that are spoiled for the new version, I'd rather just have a release than any more small new things. This is not a complaint though. I appreciate everything that you are doing and It's fine if you have plans to add more features, I just want to offer my opinion. mustafa2812, "as it is now" is not ready for release. It's not because of wanting to implement new things, it's because bugs need to be fixed and features that are partially implemented need to be finished. This is what the majority of work on any game or software is in the time leading up to release. Minor things like adding new asteroids is incidental, and does not take much time away from working to finish the version. For future reference, obviously everyone wants the new version, but it will be ready when it's ready, not sooner and not later. Reminding SpaceEngineer continuously about wanting it will not make it come any faster. So just wait. This talk about it is not constructive.